Your question sent us on a search mission – find the easiest image-based backup program we can find; and find one that is free and does incremental backups. They always say if you seek you shall find. We found. We’re so impressed with this program we almost made it our freeware pick – but then your question came along and we thought many people would be interested in an alternative to Paragon. Before we tell you what we found, we want to remind all your Paragon users that your backups you made with Paragon will only work with Paragon. So if you’re going to be switching backup programs, keep that in mind. If you try this program and like it, you’ll probably want to remove your old Paragon backups after you’ve created one with this program. The name of the program is EaseUs Todo Backup. It’s about as simple as a backup program can get. It only has four main tabs – that’s it. If you can use an email program – you can use EaseUs Todo Backup. Here’s what the developer has to say – and everything he/she says — is true. It’s a great program. I’ve (TC) have already replaced Paragon on my Windows 7 Laptop with EaseUs Todo – even though Windows 7 has built-in backup software that creates drive images (it’s not that configurable). 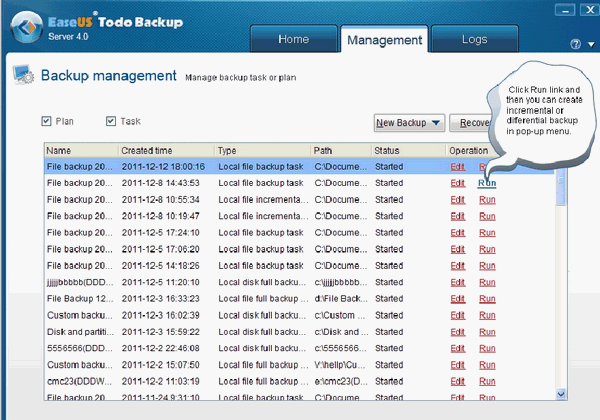 “Why choose EaseUS Todo Backup Free? It is the world’s first all-in-one backup & system disaster recovery software special for home users. It performs complete backup & recovery with multi-ways, such as one-click restore system to dissimilar hardware without reinstallation, incremental/differential disk and file backup, network shared file backup, dynamic volume backup, and automated schedule backup, etc. Brand-new interface simplifies backup process. Support GPT disk for complete backup, recovery and disk cloning. One-click to back up system and restore system to dissimilar hardware. To see a full list of features, visit this page: http://www.todo-backup.com/products/home/free-backup-software-features.htm . It has a lot of great features like checking the integrity of the backups you’ve made. A backup is no good if it’s incomplete or corrupted. EaseUs Todo makes it easy to create recovery media. And that is the first thing you should do – even before you create a backup. What good is an image backup if you don’t have a way to book your computer and use the tools provided by a backup program. Even if your hard drive goes bad and you install a brand new hard drive – you can put your disk image on the new drive and be up and running in one hour or less – as if nothing ever happened. And you dont’ have to buy the full version to get incremental backups. The only thing we can see you don’t get with the free version is support. With all the help files and online help you shouldn’t miss not having developer support at all. We can set up image-based backups for you! Learn more about our Cloudeight Direct Computer Repair service .